This three-dimensional piece incorporates a myriad of surface design techniques including; bonding, fusing, overlays with tulle and polyester organza, stamping, extensive thread work, machine embroidery, dye and textile painting and machine quilting. Commissioned to create a piece incorporating the statuesque Olympic Mountains and surrounding forest land, I photographed my original colored drawing and had that image transferred to an overhead transparency. The transparency was later projected onto the wall in the church where the piece would hang to determine the desired size. I projected a slide of my drawing onto cotton duck fabric stapled to my garage door and traced the image to size as a guide or template for my piece. Anticipating how heavy this piece would be when completed, I worked from the top down, in rows, attaching each row as it was completed with machine embroidery. 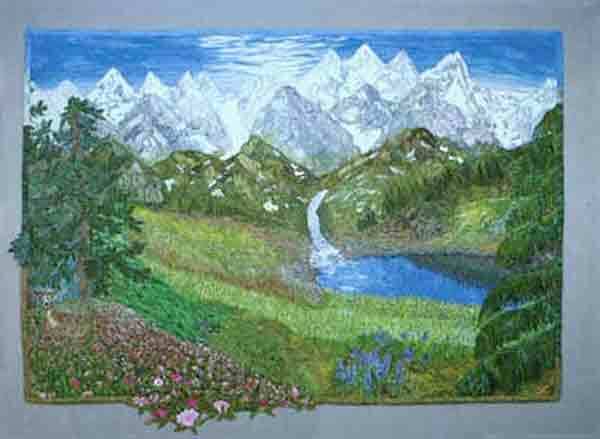 I included only those trees, flowers, plants and animals indigenous to the region. Many of my processes were invented out of necessity to fit the particular needs at the time.